Relax and enjoy the Warm Tropical Breezes and Spectacular Views from this Fabulous Oceanfront Condo in Paradise. From the moment you walk into this Air Conditioned Oceanfront Condo you will feel a Sense of Serenity and Calm as you Experience the Panoramic Ocean Views and Listen to the Gentle Surf rolling on the shore. You are just a few steps from the Beautiful Blue Pacific Ocean. Sandy Beaches extend in both directions from this Ground Floor Unit with Spacious Lanai! Exciting wind surfing & kite surfing activity, Hawaiian Sea Turtles, and other marine wildlife can be viewed directly from the condo. You can even see Humpback Whales during the winter! See the “Whale in the Front Yard” picture under "Photos". This unit has it all! A Beautiful Open Floor Plan (1126 square feet) with Ocean Views from Every Room! 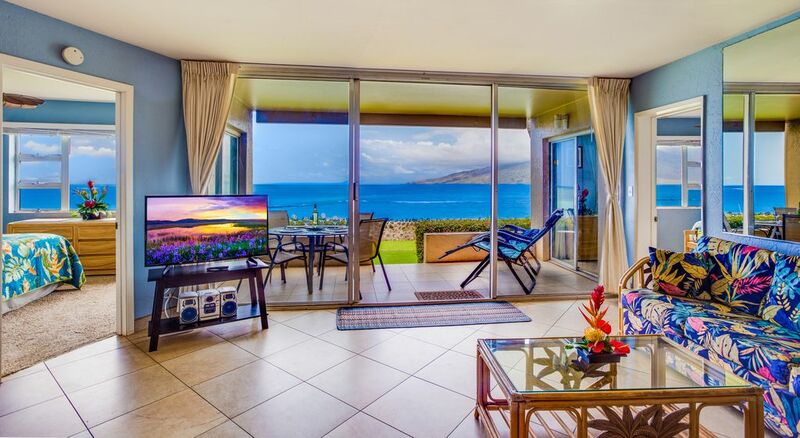 Living Room, Dining Area, Kitchen and TWO of the Three Bedrooms enjoy Amazing Panoramic Views including; the Beautiful Blue Pacific Ocean, Molokini, Kahoolawe, Lanai, Maalaea Bay and the West Maui Mountains. You can see gorgeous views from almost everywhere in the condo without seeing high-rise hotels... just the natural beauty of Hawaii. The Rooftop Area, complete with barbecues, picnic tables, and lounge chairs, also has a 360 degree view of the Island of Maui, Haleakala, and the Pacific Ocean. There are six world class golf courses within just a few minutes drive of Menehune Shores. Take a stroll through the protected wildlife sanctuary of Kealia Ponds on the open air walkway. The Maui Ocean Center and Maalaea Harbor are also just minutes away. There, you can view the ocean's inhabitants while walking through a transparent tunnel, go deep sea fishing, whale watching, and more! Snorkel and dive boats are available there as well as great restaurants and shops. The exclusive hotels and shops of Wailea are located just south of Kihei, and the old seaport of Lahaina is 30 minutes to the north. CALENDAR and AVAILABILITY - Please contact us to verify availability. We have multiple websites and reservation dates sometimes change, so it is difficult to keep all the calendars updated. We found ourselves in Kihei on our first "family" trip to Maui. We really enjoyed the laid back atmosphere, the proximity to the airport and Kahului, as well as easy access to the whole island. Menehune Shores 114 is blessed with daily tropical breezes, beautiful views of Lanai, Kahoolawe and the Pacific Ocean (you can't get much closer! ), and the relaxing sound of the ocean lulling you to sleep, all on a well-maintained property. Just to be sure this was the best possible condo, we kept looking while we were in escrow (and even after), but nothing else came close! Ground floor single level unit (no stairs in the unit), with an open floor plan, in a well maintained family friendly complex! Beautiful Ocean, Island, and Mountain views from almost everywhere in the unit! Sandy beaches are located on both sides of the property (about a 1 minute walk). The beautiful blue Pacific Ocean is about 40 feet from our lanai (patio). Just beyond the seawall. Sandy beaches are located on both sides of the property (about a 1 minute walk). You can also access the beach via the steps in the seawall. West Maui Mountains from the front and Haleakala Volcano behind. You can see the ocean from almost everywhere in the condo! The beautiful blue Pacific Ocean is about 40 feet from our lanai (patio). Just beyond the seawall. WiFi is provided free to our guests. Please feel free to email or call us if you have any questions. Wonderful home. Exactly as advertised. Quick summary: It was great. Very clean, comfortable, and exactly as advertised. Waterfront location was unreal. Very nice hosts with great communication and customer service. With 2 adults & 3 kids, we didn't feel cramped. Easy kitchen to cook in (although we hardly ever did). So close to the beach and pool. No stairs to lug your gear up and down. We were a group of 5, including 3 kids under 12. After booking this property, the hosting family did a great job of communicating with us, clearly laying out details about how we could access the property and who we could contact if we had any issues while staying there, and encouraging us to contact them if we had any questions about our trip. We did manage to lock ourselves out on the very first night (oops) but the on-island contact person was there very quickly and helped us out. This was our first trip to Maui, so we did have a few questions leading up to our trip, and the hosts were great at helping us out with some advice ahead of time. When we first arrived we were so pleased. The property was very clean and well equipped. The kids immediately ran outside onto the grass to be amazed by the views all around. The waterfront location was amazing! Access to one beach (the calmer one, enclosed by the rock walls of the ancient fish pond) was about 40 ft away, and we headed down there right away to wade in the ocean and see the turtles resting on the rock walls. There is another stretch of beach further down in the other direction that's better if you want a longer stretch of beach to walk along. The rooms had plenty of closet and drawer space. The bed in the master bedroom was comfortably firm. I didn't hear any complaints from the kids about their beds. The kitchen was clean and well equipped, and the big dining table was great. Didn't use the air-conditioners at all. Being right on the water we were able to open doors and windows and get enough of a breeze through the place. There were plenty of towels and extra linens, and the washer and dryer worked well. We loved Coconuts and the Paia Fish Market restaurants in Kihei, especially with kids. There is an Indian restaurant in the complex, which we didn't get to try but smells amazing when you walk by it. (The smells DO NOT travel down anywhere near this unit.) Kids loved the Royal Lahaina Luau. Would I recommend it? In a heartbeat. Going in March? Bring sweaters for evening. We rented Unit #114 for 10 days in January. My wife and I recently retired and treated our son, his wife, and our two young grandchildren (ages 4 and 2) to a Hawaiin vacation. Some friends recommended Menehune Shores and this 3-bedroom unit was absolutely perfect for us. It's first floor location gave us immediate access out our patio doors to the beach, pool, and beautiful grassy area where the little ones played with only light supervision. The two ocean front bedrooms were perfect for the 4 adults, and the 3rd bedroom had twin beds - perfect for the two kids. We had a wonderful time together and our stay could not have been better. The owner Jim Speth was very friendly and so helpful and accommodating. Everything was just as promised, and we'd stay there again in a heartbeat. We totally enjoyed our stay. From the moment you walk in the front door and look ahead-there is the beach and the ocean right outside of the patio. We thought the area was quiet and relaxing. Convenient location to other areas. Our group included two children (7 and 11) and they both had a great time. The total experience was great-from our initial contact with the owners all the way through. The unit was clean and as advertised. No complaints whatsoever. We are currently planning another trip to Maui with some friends and hope to be able to stay here again. Highly recommend. Amazing Ground Floor Oceanfront Condo! This Ground Floor, Oceanfront Condo was perfect for our family of 5's Christmas getaway! The condo was clean and comfortable. It had everything we needed, including a washer/dryer, dishwasher, a complete kitchen with extras and cable TV/DVD player. One of the best parts of the condo was the Lanai. You could sit out there, take in the beautiful ocean views and enjoy your morning coffee- so relaxing! The condo is located near shopping, great restaurants and activities. The owner was quick to respond to emails. We highly recommend this beautiful condo!! Very nice accommodations. Gorgeous location. Would highly recommend! This was the perfect spot for my aging parents, my brother, his wife and my husband and I. Beautiful views, just steps off of the oceanfront lanai to the beach and pool. Amazing turtles in the very shallow, calm waters. This until was clean, maintained and well stocked. It is close to all of the restaurants and entertainment that we enjoy in Kihei. This unit would also be great for a family with younger children. The owner Jim was great to work with, and the on island property manager, Jennifer, was very nice and accommodating. I highly recommend this home away from home! ALOHA! Our Wonderful Oceanfront 3 Bedroom Condo is located in Kihei on the Magical Island of Maui! The condo is directly Oceanfront (about 40 feet from the Beautiful Blue Pacific Ocean). It has Amazing unobstructed views of the Islands of Lanai and Kahoolawe as well as the West Maui Mountains! Come visit our Condo where you can Sit Back, Relax, and Enjoy the Warm Tropical Breezes and Fabulous Sunsets! We are just 10 miles (about 20 minutes) from the airport, with easy access to almost anywhere on the Island of Maui! Golf: There are many world class golf courses within just a few minutes drive of our Oceanfront Condo.